Over the Easter holidays, we went to Manor House Hotel in Okehampton. It’s a place in the Devon by the Moors where you can enjoy a multitude of sporting activities as well as crafts. One of the classes I went to with my girls was jewellery-making. Now one would think it’s just a matter of threading beads on memory wire and voila you get a pretty little necklace you would love to wear. How wrong was I.
Jewellery-making is not just making a string of colourful beads for your physical adornment; first and foremost it has to do with design. Design that is good enough you will actually wear with pride what you make! And that was tough. Since then I have had a new level of respect for jewellery designers in general who come up with pieces that sell, and in particular for my new friend the vintage jewellery designer Michelle Krausz. 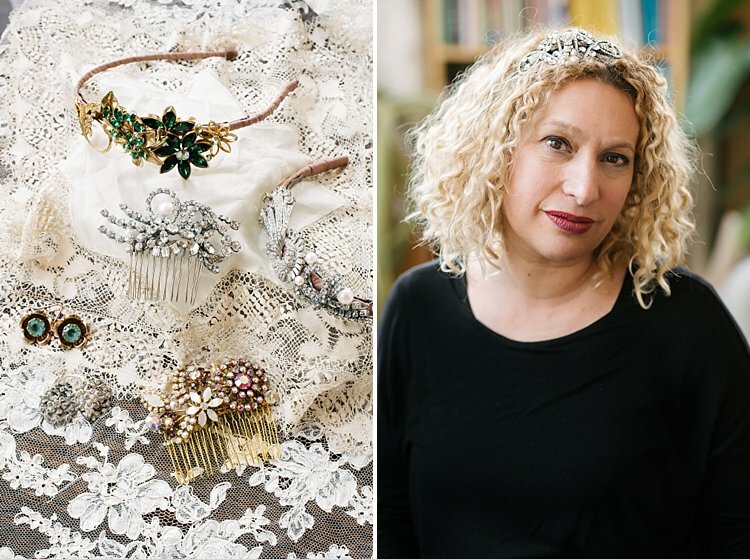 Michelle buys authentic, vintage pieces and painstakingly re-designs every gem and stone to create beautiful new and bespoke pieces for the contemporary bride who has a love of vintage. Her jewellery are worn by vintage lovers all over the world as well exhibited in various shows. When I met up with Michelle, she was in the process of shipping orders to Los Angeles for an exhibition. 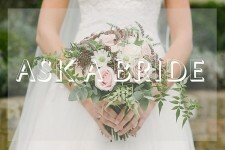 I got a peek of the stunning one-off pieces and she even kindly let me photograph them for the blog! 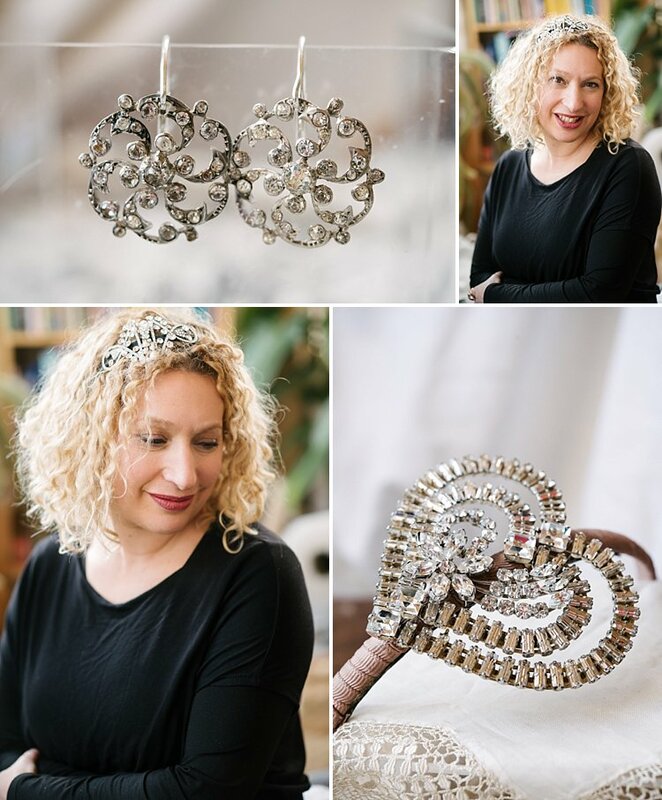 Without further ado, let me introduce you to the wonderful and talented Michelle Krausz who gives us an insight into her love for vintage and her sparkly, authentic, gorgeous new pieces. How did you get into jewellery design? And why vintage in particular? I grew up in a house overflowing with vintage treasures. My parents and grandparents were collectors of eclectic objects and art from oriental textiles, playing cards, retro furniture, antique buttons, contemporary art, sculptures, jewellery, shells and perfume bottles (to name a few). How could I fail to be inspired by all these objects, in particular the jewellery with its sense of history and beauty. How would you describe your style and who would you say your main influences and inspiration are when it comes to your style? When it comes to style, I love the understated, clean lines, block colours, red, black, navy and grey. Colour always lifts my mood on a wintery day. I prefer clothes that skim and flatter the body, I never wear anything tight. The labels I can’t live without are DKNY, Calvin Klein and Joseph (particularly from dress agencies) and I love the sophistication of Claire Danes’s style. Who are your most favourite designers / thinkers / world-changers who have shaped your values and beliefs? My father was a fashion designer during the swinging sixties with a boutique on the Earls Court Road London which was frequented by Lulu, Susannah York and Lynn Redgrave. I spent much of my childhood at his showroom surrounded by beautiful fabrics and interesting people. My mother Deborah, a talented artist, always ensured I kept an open mind and not be closed off to people and possibilities. What is your favourite item / piece of jewellery and what makes it special? 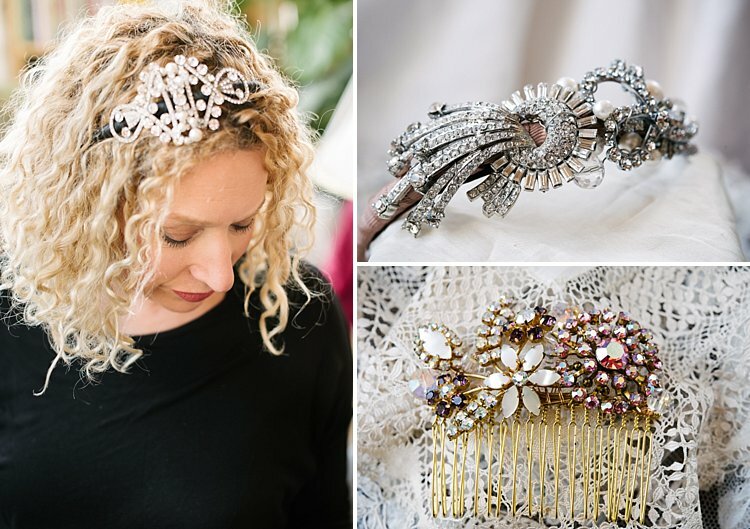 What would be your top advice for a bride looking to commission you to make a bespoke hairpiece or jewellery? A beautiful gold, onyx, coral and diamond ring, designed by my Dad for my mother in the 1970s. 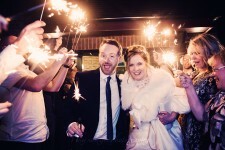 A great starting point for any headpiece commission are images of the themes/ colours of your wedding. For a ring think about what jewellery you love, are you looking for something classic, understated, contemporary. White metal or yellow gold, do you want coloured stones or diamonds? If you are going for a vintage theme, what period inspires you, eg 1930? Also is there a style of anyone in the public eye that you like. The more information you can give the better. Yes I love being a jeweller; I’m never happier than when buying precious stones and sourcing wonderful vintage pieces. I really enjoy meeting clients, the key to a successful working relationship is to listen very carefully to what the client actually wants. I love spending time on the fine details to achieve the best possible piece and a very happy client. What would your own vintage jewellery like? 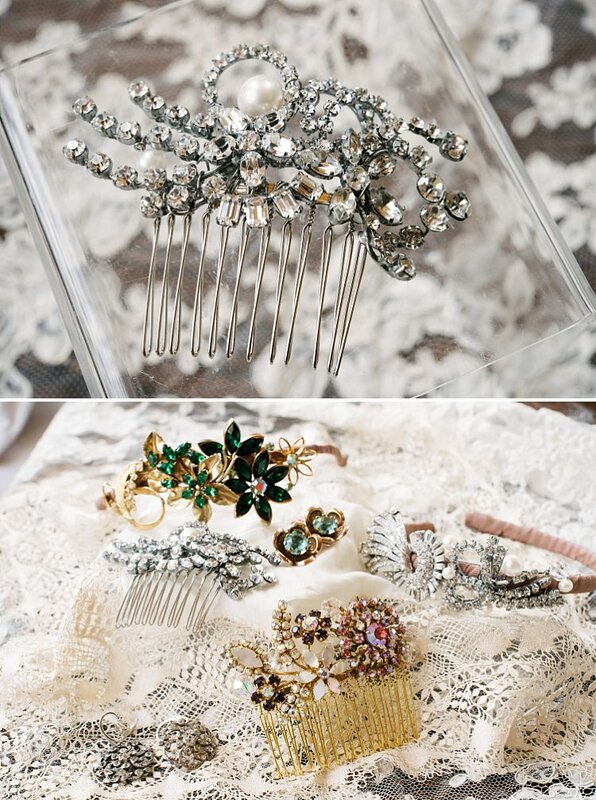 If you were the bride, what would your wedding jewellery look like? A stunning necklace and earring set from the 1940s made from rows of baguette diamonds – I would love to wear this on my wedding day. This would perfectly complement my Betty Davis headpiece using 1940s materials and fresh water pearls. I’m really excited to be working on a new Engagement ring collection, delving into the glamour of a bygone era using the 1930-1950s as inspiration and connecting my passion for vintage pieces and my experience as a fine jeweller. A simple, peaceful life, living by the sea. 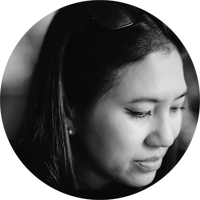 A huge thanks to Michelle for answering my questions. I absolutely adore those turquoise flower earrings! They are big gems and really make a statement. You can see Michelle’s designs on her website where you can also shop or commission bespoke pieces. 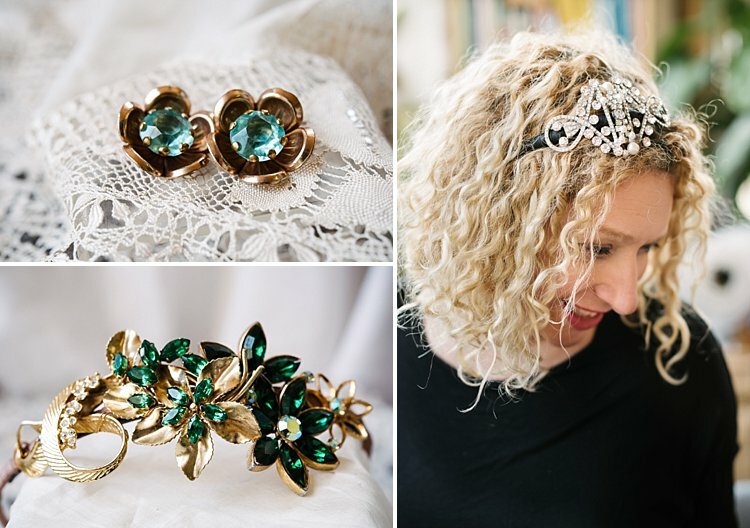 If you or anoyne you know would love vintage jewellery for your wedding or any other occasion, give Michelle a call.